What’s on Tap in Tenleytown – Special Halloween 2015 Edition | Tenleytown, D.C.
Posted on October 26, 2015 by Tenleytown, D.C.
There’s a chill in the air, and skeletons and other ghouls are rising up across the neighborhood – it’s time to explore all the spooky, Halloween revels Tenleytown has planned. 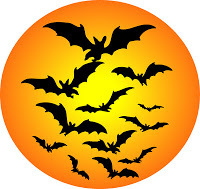 In addition to trick-or-treating on Halloween night – for which our area is recognized citywide – the community has plenty spine-chilling fun for kids and adults to enjoy all week long. The Tenley-Friendship Library invites kids ages 5 to 12 years to join them for a scary good time playing a special Halloween-version of BINGO for prizes. BINGO sessions will be held at 3:30 p.m. and 4:00 p.m.
∼ The weekly Farmer’s Market at Janney Elementary School gets into the Halloween spirit with pumpkin decorating this week. After creating some fun decor, stock up on your fall vegetables, as well as eggs and meat. The market is open from 3:15 p.m. until 5:30 p.m. in the Janney garden on Albemarle Street behind the Tenley-Friendship Library. ∼ Spirits, zombies, and ghouls have taken over the Afterschool Lounge at the Tenley-Friendship Library! Enter at 3:30 p.m. if you dare. There will be free snacks, a photobooth, a creepy craft, and music for kids ages 11 to 18 years. Costumes are welcome. ∼ Come in costume and celebrate Halloween with stories, activities, and crafts at Coffee Nature from 3:00 to 5:00 p.m. Sponsored by lil omm yoga and Alexis Dionne Campbell of Usborne Books, this special Halloween Story Time is free and open to the public. Coffee Nature is located at 4224 Fessenden Street, NW. ∼ Tenley Bar & Grill hosts a pre-Halloween karaoke costume party starting at 9:30 p.m. Prizes will be awarded for the best costumes, including tickets to attend a Washington football team game. Enjoy drink specials, grab the mic, and start your Halloween party early. Tenley Bar & Grill is located at 4611 41st Street, NW. Saturday, October 31 – HALLOWEEN! ∼ Start your day off at 10:30 a.m. with a spooktacular fun story time for the whole family at the Tenley-Friendship Library, filled with Halloween-themed songs, rhymes, and books. Make sure to wear your costumes. Your librarian will be wearing hers. ∼ Before the kids head off trick-or-treating, bring them to the Tenley-Friendship Library for Creepy Crafts and Trick-or-Treating. Craft stations will be open from 11:30 a.m. until 3 p.m., or while supplies last. Perfect for kids up to age 12. Costumes encouraged! ∼ The AU Symphony Orchestra and Music Director Yaniv Dinur will perform under the spell of witches and ghosts in a frightfully fun family concert. Don’t forget to wear your spookiest costume to the Halloween Spooktacular! The concert begins at 3:00 p.m. in the Abramson Family Recital Hall of the Katzen Arts Center. Tickets are $10 regular admission, $5 for American University community and seniors, and can be purchased online. ∼ Join Bread & Salt for an all-night Halloween Party, from 9:00 p.m. until 2:00 a.m. The spooky fun includes a costume contest, door prizes, live music, stand-up comedy, and more. Happy hour specials will be available all night long. Put on that costume and head to 4619 41st Street to join the party.